Who on earth is Lou the Lisper? 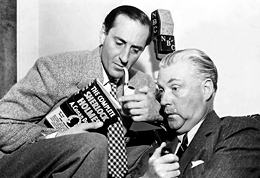 The New Adventures of Sherlock Holmes was a very popular Old-time Radio (OTR) show that aired in the United States, and starred Basil Rathbone and Nigel Bruce from October 1939 to July 1947. The episodes were written by Edith Meiser, Dennis Green and Anthony Boucher. 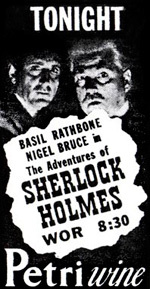 Together, Basil Rathbone and Nigel Bruce appeared in 220 episodes as Sherlock Holmes and Dr. Watson. Rathbone left the series in 1946, not wanting to become typecast and his last episode as the detective was The Baconian Cipher. Bruce stayed on for another season until 1947, with Tom Conway getting the daunting job of replacing Rathbone in the part of Holmes. Despite his similarity in voice to Rathbone, Conway's colder and slightly acerbic interpretation proved unpopular and he was replaced by John Stanley after 38 episodes. I quite like Conway's Sherlock Holmes, now that I've listened to his episodes a few times and I recommend them. The show aired weekly on Mondays from 8:30 to 9:00pm and was broadcast from Hollywood. The episodes are presented as Dr. Watson's reminiscences of his days in Baker Street with Sherlock Holmes. Watson sits in his Californian home and regales the host of the show with entertaining tales of his adventures with the great detective. Sometimes they bring in another character to contribute to the story, and the structure of the show allowed Watson to flesh out details of the story and sum up at the end. Rathbone plays Holmes with his usual finesse and Bruce's portrayal of Dr. Watson is noticeably less bumbling than in the films. Although he still has his moments, Watson is of more use to Holmes in solving some of the cases. The superb character acting of the supporting cast and the latest special effects technology of the age help make these episodes very enjoyable to this day. And of course, the show was very popular in its time, with families gathering round the radio every week evening to listen in. The plays have endured the years very well and they are the most popular OTR show today, with many sites dedicated to keeping the episodes alive – see links page. The OTR stories have much more humour than today's somewhat glum interpretations, and that certainly lends to the series' success and longevity. Some of the actors that appear in the film series also make an appearance in the radio plays, but I have only my ear to attest to that. Mary Gordon is often in her familiar role as Mrs Hudson, and Dennis Hoey appears as Inspector Lestrade in one of the earlier episodes. Other actors that appear to be particularly prominent are Frederick Worlock, Carl Harbord and Rex Evans. See the supporting cast page for more details and photos. I currently have 54 episodes, and I think that's almost all the ones that are known to have survived. Sadly, the majority are still lost, there are rumours that up to 150 episodes have survived but most are not available online as far as I know. I would give my right arm to get hold of a copy of Rathbone and Bruce's The Hound of The Baskervilles six-parter. All of the OTR episodes are in the public domain, so they're out of copyright and free to download here. The one chafing thing about the show is the interruptions by the host on behalf of the sponsor – usually Petri Wine – at the beginning, halfway through and at the end of each story. On average, the adverts total about six minutes per episode, so I've removed them from all the episodes in my possession while keeping some of the banter for continuity. I've also edited out the adverts from the 38 episodes starring Nigel Bruce and Tom Conway – you can buy both these CDs here.